Author: Tennis, Joe Set In . . . Description: The mountains, rivers, and lakes of Southwest Virginia have invited explorers since the mid-1700s. Now this land beckons the modern traveler with its siren song of beauty, wonder, and history. 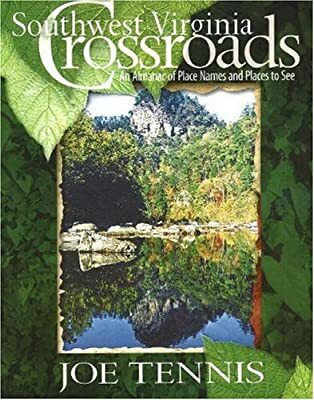 Southwest Virginia Crossroads: An Almanac of Place Names and Places to See extols the virtues of this national treasure and serves as a guide for those who want to find the best of America. As you journey with author Joe Tennis through Southwest Virginia Crossroads, he relates the history of the land and its people, chronicling the fascinating stories birthed in this fabled region, as well as age-old place-names and their origins. County maps and detailed directions lead you to all the little- and best-known attractions housed in cities and towns like Bristol and Abingdon or sheltered within the rolling farmland and weathered mountains. Even those familiar with the area will want to visit waterfalls, lakes, towns, cities, restaurants, and historical sites discovered in the! pages of this comprehensive work. Whether on the car dashboard or at home on the coffee table, Southwest Virginia Crossroads is a wealth of knowledge and a delight to read. This book was released in a second edition in 2017, staying true to the original local bestseller of 2004 yet loaded with updates, expansions and even more photographs showcasing Southwest Virginia.